All natural ingredients. Free from lactose. Made with cows milk. Real dairy taste. Farmer Owned - care in every step from cow to you. Suitable for vegetarians. Packed with nutrients* Easier to digest* Welcome to feel good dairy* When ti comes to wellness and feeling good, nobody knows you like you. So if simple, nutritious, delicious goodness is your thing, then don't hold back. Slurp, gulp, guzzle. Go with your gut and live with all your might. LactoFree. Delicious dairy goodness that's easier to digest* Best enjoyed the way you like it. 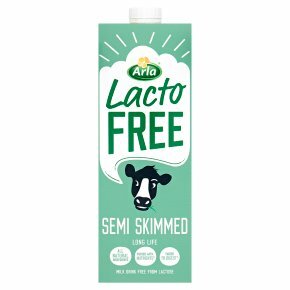 Lactose Free* UHT homogenised standardised semi skimmed filtered milk drink *Easier to digest if you may be lactose intolerant or have a sensitive gut. Less than 0.03% lactose. We use rigorous scientific testing to ensure that Arla LactoFree milk drink contains no lactose, using accurate accredited tests, enabling us to detect lactose at a trace level of 0.03%. At this level our tests show that there is no lactose present in Arla LactoFree. Rich in protein, rich in vitamin B12, source of calcium Delicious dairy goodness that's easier to digest and... Rich in protein Protein contributes to the maintenance of muscle mass and normal bones. Rich in vitamin B12 Vitamin B12 contributes to the reduction of tiredness and fatigue. Source of Calcium Calcium is needed for the maintenance of normal bones and teeth.